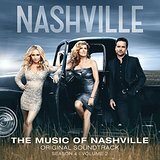 After four seasons, ABC pulled the plug on its hit series, “Nashville.” The reaction from fans was swift and intense. It almost felt like their favorite band broke up and that is true in many ways. The triple Exes, The Avery Barkley Band and Maddie Conrad felt as real as actual country stars to millions of fans. That’s probably because the cast has legitimate talent and some have street cred. Johnathan Jackson (Avery Barkley on the show) formed E Nation in 2002, tours regularly and recently signed a deal with Loud and Proud Records. Will Chase (Will Lexington) recently put out an EP that has garnered critical acclaim). The ensemble cast performed regularly sold out shows at the Ryman and Madison Square Garden. The final soundtrack showcases the talent of Lennon Stella who plays Maddie Conrad, Connie Britton’s daughter, on a Taylor Swift-ish rise to fame. While the previous albums highlighted Claire Bowen (Scarlett O’Conner) as the standout female vocalist, the finale clearly passes the torch to Stella. Her raspy mezzo soprano on her signature, “Wild Card” belies her youth and is a pleasant divergence from the high powered sopranos of the other female cast members, especially Panettierre with her arena ready vocals. One of the main storylines was Will Lexington’s (played by Will Chase) struggles as a gay artist in the industry. Ironically, he plays the new bro country kid on the block with one of the most masculine, outlaw country baritones in the group. He is as effective on up tempo numbers like “Movin’ On Never Felt So Good” to the gentler ballad “Ain’t It Beautiful.” Also in a twist of irony, the two lead characters, Britton and Charles Esten shine more into their acting roles as protective parents than the fictional music super star duo they once were. At least CBS viewers of the iconic “Dallas” knew who shot J.R, Ewing, but barring a pickup by a streaming service, fans will never know if Juliette died in a plane crash.